During the Siege of Leningrad, which lasted for nearly 900 days between 1941 and 1944, people had to be creative beyond measure simply to stay alive. Because most of the men were away at the front, that burden fell largely on the city’s women. Although the government supplied rations according to hierarchies of labor, the amounts were too paltry to stave off starvation, so women had to innovate. They began by slowly braising and softening the tough outer leaves of cabbage they previously had discarded, turning them into a dish called khriapa. But soon they had to resort to more desperate acts. They retrieved old flour dust from the cracks in floorboards and licked spattered grease from the kitchen walls. They tore books apart for the glue from their bindings and scraped wallpaper paste from the walls (before the age of synthetics, glue and paste were made from animal protein). These practices were necessitated by a ration that, at its lowest, allowed for only 125 grams of bread a day. And this wasn’t even normal bread. In addition to rye flour it also contained “edible” cellulose, cottonseed-oil cake, chaff, and the dust shaken from flour sacks. This siege loaf was damp, heavy, and greenish-brown. Its texture was crumbly, yet gummy on the tongue. The authorities periodically provided foodstuffs that had been salvaged from industry. Especially distasteful and hard to digest were the hard cakes of pressed seed hulls left over from the processing of oil from sunflower, cotton, hemp, or linseed. Originally meant for cattle fodder, these cakes were often too hard to break into pieces by hand. A knife or axe blade was used to plane them like wood, and then the shavings were fried like pancakes. Other industrial products included olifa, boiled linseed or hempseed oil. Used in classical oil paints, olifa could be metabolized like edible oil, with the same nutritional value, but the flavor was vile. Even so, it was preferable to machine oil, which people stole from factories that had ceased production. Although machine oil generally went right through the system and had no nutritional value, there was always a chance that it was based on animal fats or vegetable oil rather than petroleum. Similarly, the coarse siege bread seemed more palatable when fried in paint thinner. The inner side of pig- or calfskin could be boiled for hours to make a kind of soup. Since soup is such an important component of Russian cuisine, an integral part of the daily meal, women often made soup out of the family’s bread ration instead of just serving the bread plain. Although it consisted of nothing but breadcrumbs and water, the whole felt like something more than its parts. And it was certainly more appealing than the murky white yeast soup derived from cellulose that was given out instead of a grain ration. 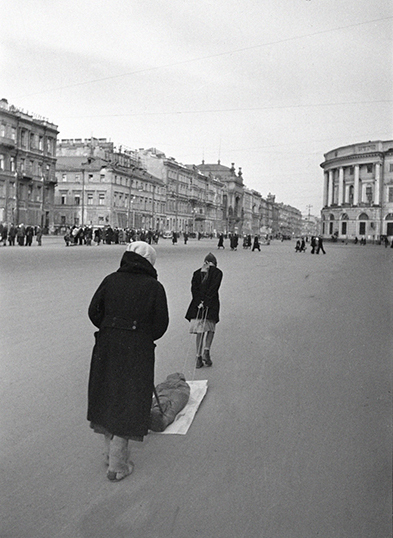 As the siege continued, and hunger grew, the people of Leningrad grew increasingly desperate and resourceful. Women scoured the city, braving artillery fire in their search for food. At night, dressed in dark clothes, crawling from row to row, they chopped at the frozen ground to dig the potatoes that lay rotting in the fields outside the city. Survivors tell of readily, even avidly, eating the wood shavings, peat, and pine branches they scavenged. Joiner’s glue became standard fare for many. Nearly all of the siege survivors express nostalgia for the “sweet earth” they salvaged from the site of the Badaev warehouse fire in which 2,500 tons of sugar melted onto the ground. For months after the fire they used axes to chop away at the frozen earth and loosen the soil, still saturated with sugar. Retrieved down to a depth of three feet, the soil sold for one hundred rubles a glass; from more than three feet below the surface it cost only fifty rubles. This “sweet earth” could be heated until the sugar melted, then strained through several layers of muslin, or it could be mixed with library paste to make a kind of gummy confection. People often called this concoction “candy” or “jelly” because it seemed like such a treat. For Russians, food has meaning only when it is shared, and in blockaded Leningrad sharing was nearly impossible. The unnatural role into which food was cast represented a particularly debasing aspect of siege life, one that went against the very idea of hospitality that the Russians hold so sacred.